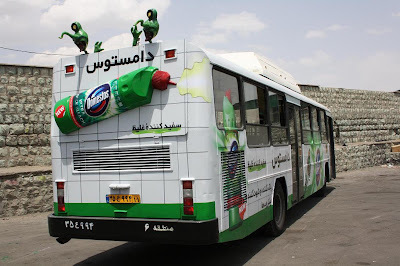 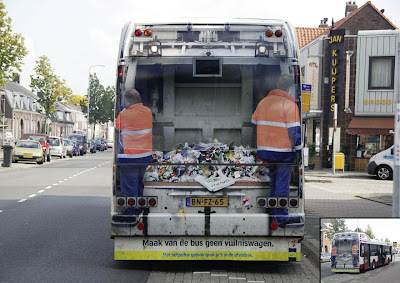 Creative and cool uses of buses in advertisements by various companies from all over the world. 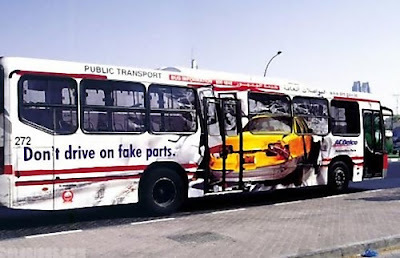 The Naval Museum of Alberta Bus Advertisement: The porthole view image was fixed on a swivel and pendulum, so that it would create a rocking movement when the bus accelerated or stopped. 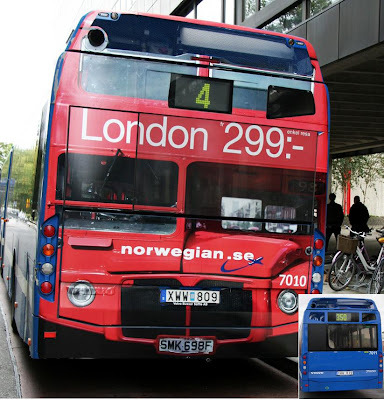 Norwegian Airlines Bus Ad: To promote its low fare flights, Norwegian Airlines brought left-hand traffic to Sweden by turning the back of Stockholm buses into the front of London's classic double deckers. 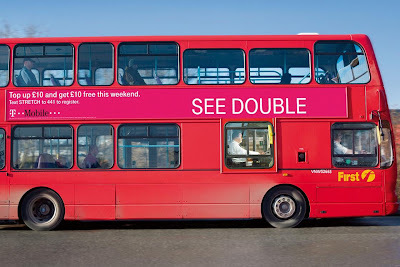 T-Mobile Bus Advertisement: "See double" was created to promote the T-Mobile, UK weekend offer of top up. 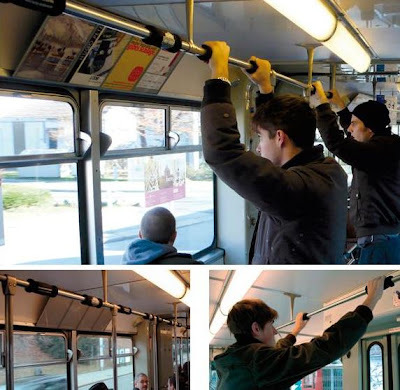 Metro Bus Advertisement: On bus window panels, posters of people reading 'Metro Newspaper' were placed creating an illusion that all the passengers are reading newspaper. 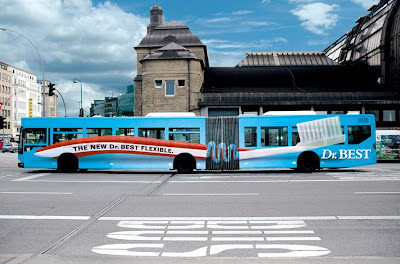 Domestos Bus Advertisement: "Would you sit in this bus?" 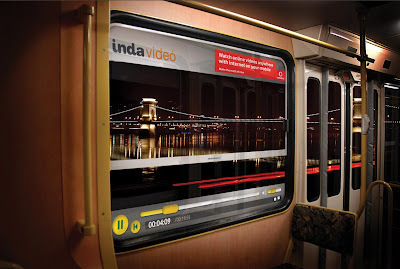 Vodafone Bus Advertisement: To promote Internet usage on mobile phone, Indavideo bus window stickers were placed with the message: "Watch online videos anywhere with Internet on your mobile." 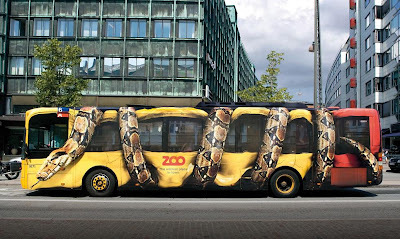 Copenhagen Zoo Bus Ad: Copenhagen-based ad agency created this realistic painting of a giant constrictor snake around a city bus. 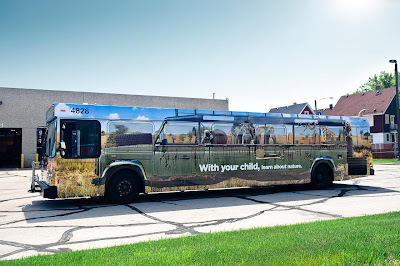 Safari Bus Advertisement: This bus ad was created to show the positive effect of parents' involvement with their child's education has on chances of success in the classroom. 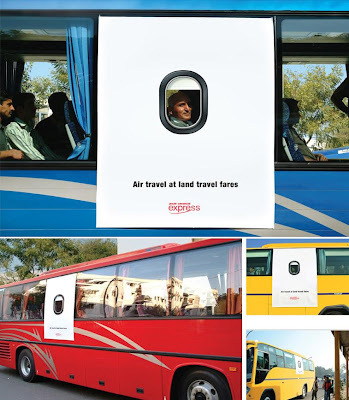 Air India Express Bus Advertisement: "Air travel at land travel fares". 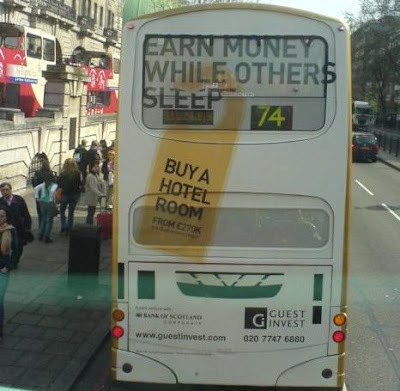 GuestInvest Bus Advertisement: GuestInvest, a company that gives you the choice to buy a hotel room and rent it on your behalf like a hotel - has put some advertising on the back of this bus with a cool strapline "Earn Money While Others Sleep." 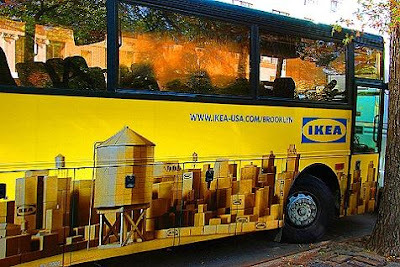 Ikea Bus Advertisement: Ikea built a mini New York City out of boxes, photographed it, and then pasted it on a huge bus. 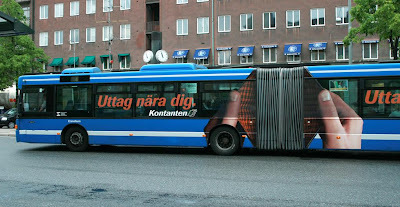 Kontanten Bus Ad: "ATMs close by." 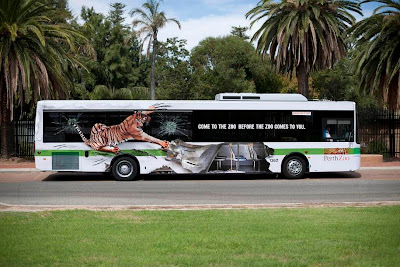 Perth Zoo Bus Advertisement: "Come to the zoo before the zoo comes to you." 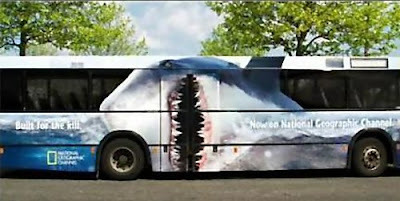 National Encyclopedia Bus Advertisement: "All you need to know. 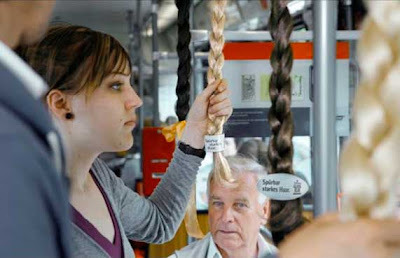 And then some." 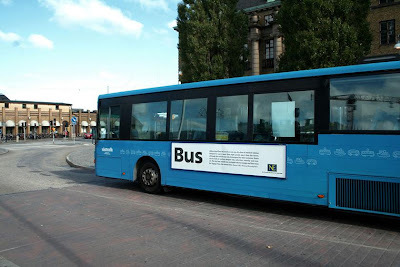 Harley Davidson Bus Advertisement: Motorbike handles were used in buses to announce the arrival of new Harley models. 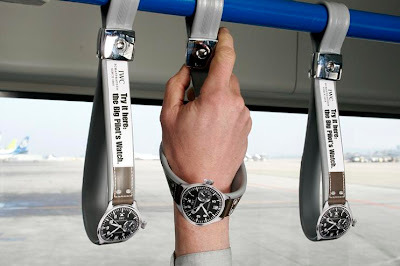 Big Pilot Watch Bus Advertisement: Images of the Big Pilot's Watch were been fashioned into samplers by attaching them to the handles in buses. 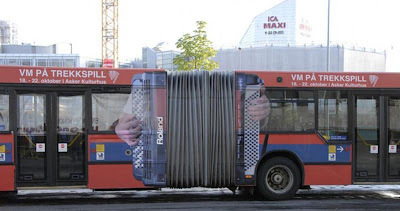 Gard Shampoo Bus Ad: Creative bus handles promoting Gard active strong shampoo in Frankfurt, Germany. 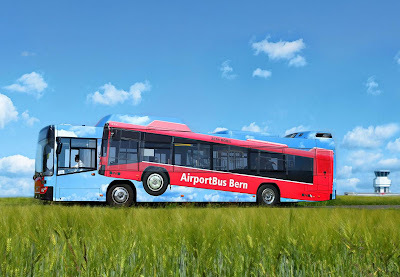 Bernmobil's Airport Bus Advertisement: Interesting and creative concept by Swiss advertising agency, intended to show a bus 'taking off' for the airport. 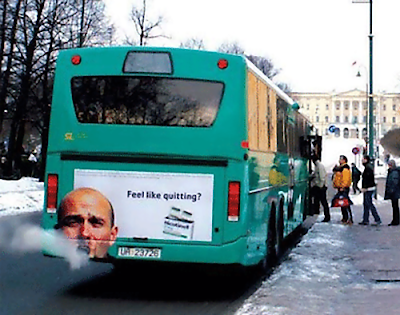 Nicotinell Bus Advertisement: "Ready to quit?"